Kheer is a traditional Indian sweet. Kheer may be called as Rice pudding in English. In India , Kheer is given high importance than any other food. It is symbolic to festive food and special occassions. Kheer is considered good luck in various as per indian values. There is saying called "Muh meeta karlo, Subh kaam shuru karlo" which signifies the importance of sweets in India. Basically Kheer is a sweet dish basically made of rice, milk and sugar or jaggery as its main ingredients with added flavours of nuts which is also used for decoration. The preparation of Kheer starts with boiling the milk and reducing it or skimming it, followed by adding nuts and sweetener. In India and its sub-continent, Kheer is used in major festivals in every religion. For instance, Hindus prepare it during Diwali, Holi , Karwa Chouth etc.. and muslims prepare it for Rajjab and Ramzan. Parsis Prepare a different kind of rice kheer for Novroze. Kheer is called Payasam in South India, Kheeri in Orissa, Khir in East India , Kheer is North India, Payesh in Bengal and Payasa in Some south eastern parts of India. 1. Rice Kheer 2. Phirni 3.Gajrella (Carrot Kheer) 4. 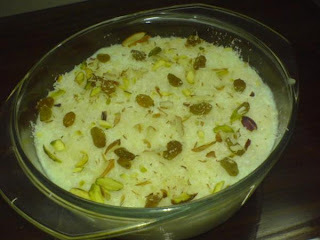 Lauki Ki Kheer 5. Zafrani Kheer (Saffron Rice Kheer) 6.Gur ki Kheer (jaggery Kheer) 7. Fruit Kheer. In a heavy bottomed pan, on medium heat, add in the the Milk and the Rice. Grind the Saffron with a little bit of Sugar and add it to the Milk. Meanwhile, soak the Raisins in a little bit of water to help puff them up. Keep stirring the pan and make sure it does not burn at the bottom. Once it reaches the desired thickness, add in the Sugar. Mix well. Add in the Dry fruits - Raisins (without the water), Pistachios and the Almonds. Turn off the flame and add in the Powdered Cardamom. Serving suggestion: Serve hot or chilled as per choice. This is a great recipe if you don’t have a lot of time but alternatively, you can add in raw rice and cook it in the milk and it tastes great. But be very careful and and keep stirring frequently. If you are cooking in Microwave , then cook it at 850W after mixing milk, rice, cardamom, sugar and saffron in microwave proof dish.Then add some heated ghee and nuts and further cook for 10 minutes. Click here to know more about Indian Sweets and Desserts - An Introduction To Indian Sweets .